West Bromwich Albion manager Tony Pulis has not given up on signing Cardiff goalkeeper David Marshall before the transfer window closes on 1 September. Scotland international Marshall is the subject of a bid thought to be in the region of £5m. Cardiff have asked for more money, but Welshman Pulis is still hopeful a deal can be struck. "It's out of my jurisdiction now, it's down to the money men. Never say never until the window closes," he said. "We'd like Marshall, and the two clubs have been talking for nearly five weeks." 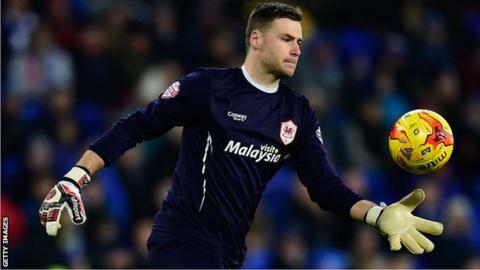 Marshall, 30, is under contract until the end of the 2017-18 season, having signed a long-term deal with the Bluebirds in February 2014. That was during the Scotland international's impressive campaign in the Premier League, which prompted interest from several clubs. Cardiff were relegated at the end of the 2013-14 season and made Marshall captain as they ended the last campaign in 11th place in the Championship. The Scotsman was suspended for the start of this season, but played in the 2-0 win over Wolves.